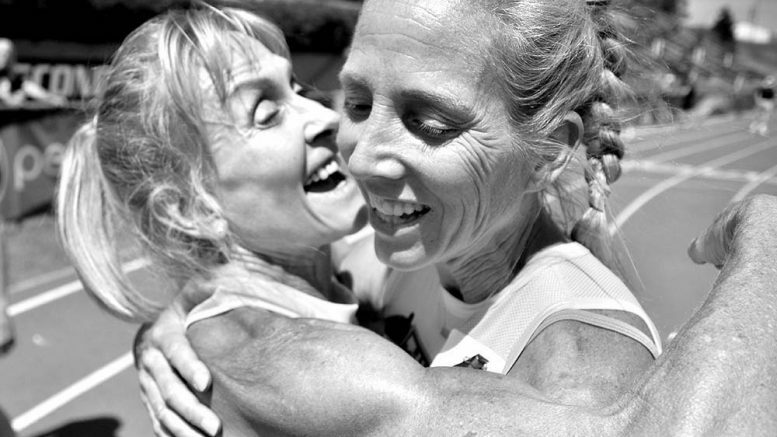 Lesley Hinz (left) hugs her friend Sue McDonald after Sue lowered her own W55 American record for the 800. As expected, Charles Allie is being considered for World Masters Athletics Athlete of the Year — both in the overall and sprint-group categories, WMA has announced. His M70 records at Malaga and elsewhere should make him a shoo-in for the top male prize. No American women are up for the overall Athlete of Year honors, but three Yanks have good shots at event awards — W60 middle-distancer Lesley Hinz, W65 distance great Sabra Harvey and W60 throws legend Carol Finsrud. Besides Charlie, American men in the finals for event awards are M50 middle-distancer Charles Novak, M75 thrower George Mathews and M60 high jumper Pete Hlavin. Only Australia (the bulk of Oceania WMA region), with nine nominees, has more than USA’s seven up for honors, with nearly 30 nations represented. Canada is third with six nominees. WMA doesn’t say when the final winners will be named, but Tuesday was the final day for nominations. 3 Comments on "7 Americans, led by M70 sprint sensation Charles Allie, among nominees for WMA annual awards"
Might need to recount the number of Australians. Thanks, Ernie! I’ve updated post to show nine Aussies are in running. Curious why there are two men from NCCWMA nominated for WMA AOY…Charles and Montiel of Mexico.